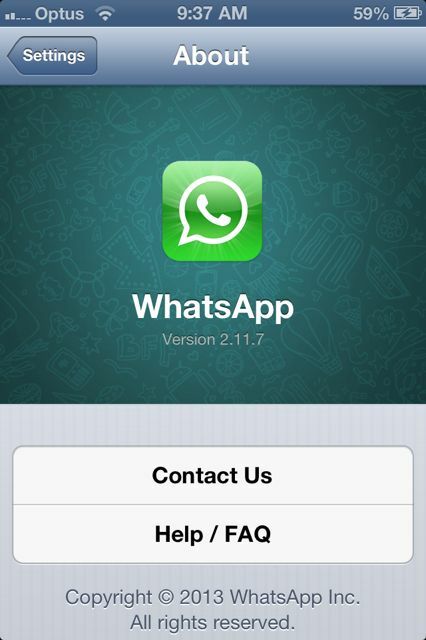 Rapid growth of WhatsApp should actually make Facebook frightened. Ever since Facebook swapped the GDP of a mid-sized nation for a simple messaging service, the chart below is getting a lot of attention. But I fear its main point is being missed. 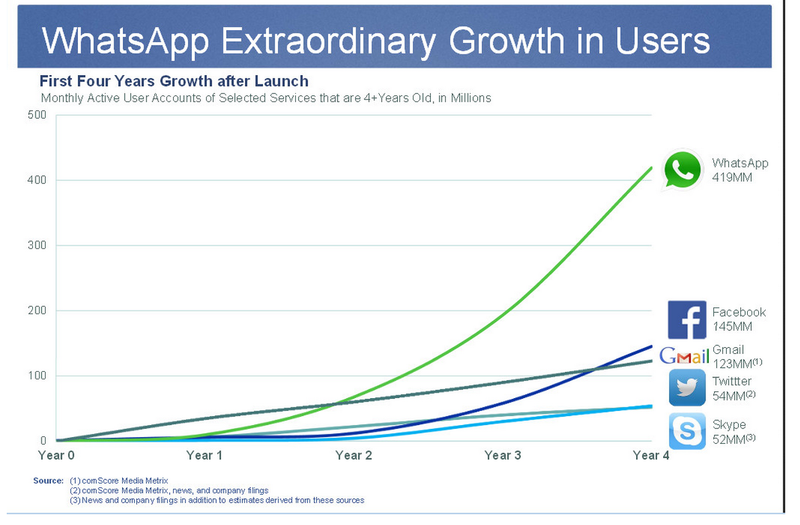 Facebook got so excited by this sort of user growth that it spent $US19 billion buying WhatsApp. But it should be cowering. Facebook’s biggest single virtue now, is that it’s the social network your friends are on. Facebook’s entire $175 billion market value hinges on the idea that this “network effect” is enough to lock you in and make sure you never leave. Is it? The first person to install WhatsApp had no way to use it. The second person to install it could only contact the first one. The thing had no real value until a decent-sized circle of your contacts was on it. Despite this, despite the presence of other perfectly good options, like email, SMS, Viber, and despite its terrible IT-developer’s-idea-of-a-pun name, the application has grown faster than anything the web has ever seen. WhatsApp’s growth shows people are now damn comfortable in the app store. Nobody is worried about hitting install, checking something out, and deleting it later. That represents an important – but predictable – change in consumer behaviour. And a major threat to the apps we already have installed. Facebook perhaps recognises it could be gazumped. It is trying to make our commitment to Facebook a virtue, with, for example, recent videos reflecting our history on Facebook, etc. But if its major selling point is that it stores your old memories, will that be enough? If we all keep our Facebook – like we all keep our old school photos – but use something else for day-to-day use, then Facebook loses. There’s another even bigger point to make here about the lesson of WhatsApp’s incredible growth. When I wrote about Facebook’s acquisition of WhatsApp a few days ago I mainly just goggled at the incredible price. $US19 billion in cash and stock, or about $A21 billion. Since then I have had a very constructive argument with someone I respect greatly in the tech space, about what the point of the acquisition is. I argued you could have lots of customers but no good way to monetise them. Twitter was a really good example, I said. The old-school capital market guys that floated facebook and were currently propping up their shareprice would, I reasoned, have to learn the hard way to not rely on their old-world model that says a successful business is one with lots of customers. But I got an eye-opener in response. That made me think about the way I look at the internet. There is one company that has created “sufficient user lock-in and network effects” to be considered the backbone of the internet. Google. Revenue of $15 billion and profit of $3 billion in one three-month period in 2013. Google is to the internet what the state-owned telecommunications companies were to the early days of the communication by wire. A behemoth. The question then becomes, is Google a model for the rest of the net? Can Facebook et al do that too? Or is Google an outlier? The telcos became rent-seeking middlemen by owning a network that could not be replicated. They had physical wires that they controlled. Competitors needed to make huge investments to beat them. There’s an analogy to Google there. Google’s core products, search and ads, are protected by both being smarter than the competitors, and expensive to replicate. They look safe. But its various add-ons, like Maps, Gmail, Youtube and the play store could in theory be beaten. It has happened before. See: 10 Google services that failed and why. Facebook’s offering is not necessarily expensive to replicate. Open source social networks are out there. Market leaders diaspora and Movim both make privacy a big feature. Who knows what the spark will be that sets them, or something like them, on the path to exponential growth. Goldman Sachs and JP Morgan take note. The Google model may prove to be a once-off. The internet will continue provide a lot of terrific services, but will not necessarily continue to provide a lot of money. The economic rule that price equals marginal cost of production in the absence of market power has not broken. And marginal costs online are often very close to zero. Just to emphasise this point, I’d like to finish this piece by introducing you to an app called Telegram. It does everything WhatsApp does, but cheaper. There are no ads. There are no fees. And it is run by a not-for-profit. Posted on February 24, 2014 Tags facebook, the internet, WhatsAppLeave a comment on Rapid growth of WhatsApp should actually make Facebook frightened. WhatsApp will be bought by Facebook for $19 billion. That would make it the 14th most valuable company on the Australian Stock Exchange, more valuable than Fortescue Metals, more than Macquarie Group, two thirds as valuable as Rio Tinto. The deal puts the $1 billion Facebook paid to buy Instagram firmly in the category of forgotten history. Whatsapp, for those of you not in the know, is just another way to send text messages. It has been downloaded over 100 million times, but it is free for the first year, doesn’t sell ads and costs $0.99 a year thereafter. So yes, it is a graveyard for investors capital. The internet economy is great for consumers. But the expected monetisation of all this time spent is just never going to happen in the way companies seem to believe. Time spent online is not like time spent walking around a mall.